Stubble comb—this comb offers you twelve length settings from one millimeter to twelve-millimeter with one millimeter between each setting. Hair comb guide—this attachment is an extra-added bonus that will help to create new hairstyles or keep the current one in style. It offers eighteen length settings from three millimeters to twenty-millimeter lengths. There is precisely one millimeter between each setting. The blades are self-sharpening chromium steel that will give you long-lasting performance. The combs and rounded blade tips help to prevent skin irritation. This Philip Norelco beard trimmer has eighteen built-in length settings. As you use this trimmer you can create different beard and hair styles. The precision trimmer will create contours, and fine lines. The turbo power helps trim through thick hair gently and evenly. It comes with lithium-ion power that up to sixty minutes of cordless use. It is also adaptable for the different voltages worldwide, with 100-240V. It also comes with the pouch that you can store your beard trimmer in while traveling or at home when it is not in the power docket. The dimensions are 1.5 x 1.5 x 5.5 inches and one pound in weight. Only takes one hour to charge or you can choose quick five-minute charges that will give you one complete trim. The plastic casing is slick so you have to be careful that you do not drop it. When looking at trimmers the brand name Phillips Norelco is the name that has been around since 1939 when they began to produce electric shavers. 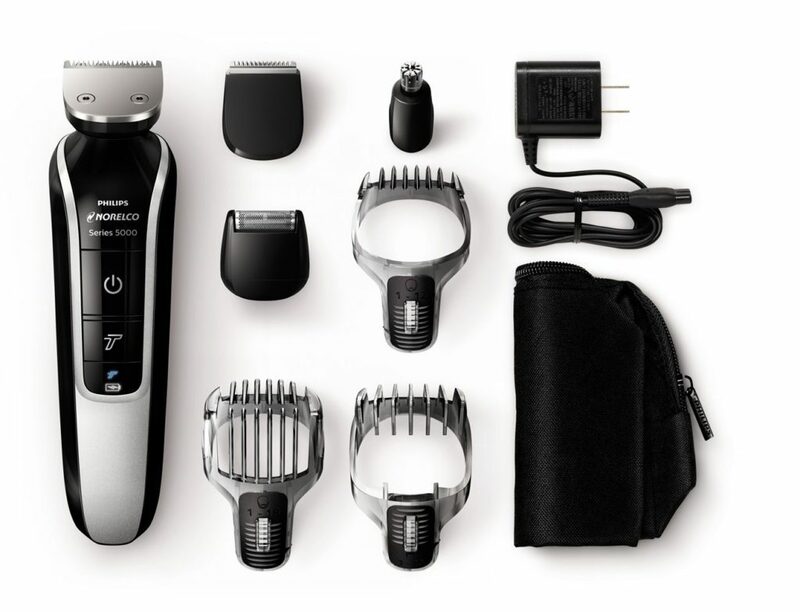 The Phillips QG3364/9 Norelco Multigroom 5100 Grooming Kit (7 attachments) has everything that men could need in beard trimmers. It can trim your hair or beard in eighteen different lengths and with all the heads and comb attachments you are sure to get your desired look. Philips is one of the top rated companies for beard trimmers and we recommend this one. It is one of the top 5 bestselling beard trimmers in the US, and comes in with 4.1 out of 5 stars with well over 1500 beard trimmer reviews, and 78% of the reviews 4 star or more, and only 8% with one star. This beard trimmer is used to cut the man’s facial hair to certain lengths. Generally, beard trimmers feature multiple length settings that enable you to grow your beard out to longer or shorter beards. The settings can range from tenth of an inch to one-half inch, depending on the trimmer. It functions by using many sets of thin metal blades that are tipped with teeth. Typically, the trimmer blade is stacked on top of each other with each blade being about one inch wide. When you turn the trimmer on it causes the blade to oscillate and to overlap periodically. When you place it against your face, the oscillating blades will cut any of the facial hair that they touch. To prevent the blades from touching your skin directly there is usually a protector that is plastic that will cover the blades ends. This protector is controlled by a wheel or switch on the beard trimmer. It can be found on the side of the trimmer. The safeguard will allow you to position the space from the skin that the hair will be cut. The safeguard will allow the trimmer to be used to keep or create different styles of facial hair. When the protector is set to the furthest space from the blades it can be used to maintain your full, long beard. This is done by removing only the hairs that are very disorderly or long. If you place it closest to the blades you can have the five o’clock shadow or stubble look. It has stainless steel blades and the case is made of plastic. Many of the beard trimmers on the market today are battery operated but some contain rechargeable batteries. Once you put the trimmer in the power dock, it will recharge. Most beard trimmers also come with the small brush and comb for various uses. You can use the comb for the length guide if the trimmer is being used without the protector or for maintenance of your beard. You can use the brush to clean the blades.